The One Best Thing was created to demonstrate the use of Apple Technology in classrooms. This is a collection of books to demonstrate technology with teaching and learning. It shares units, lessons and allows practicing. There are projects, lessons, and activities teachers can develop from these books. It's a good resource for ideas to replicate in classrooms. 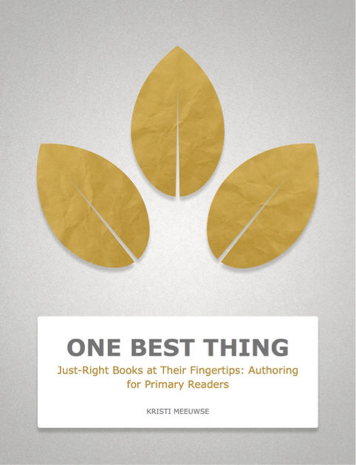 Kristi Meeuwse has book called Just Right Books at Their Fingertips that is a great example. 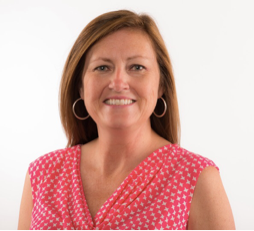 Kristi Meeuwse has a Bachelors degree and a masters in Early Childhood Education. She went to Clemson University and the University of Charleston. She is Nation Board certified as well as has a classroom that shares a literature lab in South Carolina. Kristi Meeuwse is now teaching kindergarten and classifies as a literature specialist in her classroom. She's big on using iPads and happens to be the CEO of iTeach with iPads. She has a blog called iTeach with iPads so her fans can read more of her great ideas like her book, Just Right Books at Their Fingertips. Just Right Books at Their Fingertips is about an app used by teachers to create books on their students different reading levels. This app is called iBooks Author. It allows you to build your books for your class. Kristi Meeuwse's 15 page book was created to help teachers find a way to help with informational texts in the classrooms. This app has helped her students move to their grade level in reading and above for 3 years after they get out of her classroom and go to another. Students are able to read on their iPads and find books of their interests. The Levels are organized based off of difficulty in length, layout, organization, illustrations, words, and content. The three steps to creating books are to pick the major themes for the book, create the content, and then write texts in the pages. Kristi wrote her first book on spiders. She said that writing in kid language increases their comprehension and promotes engagement for her students. Allowing variety in her subjects allows kids to read what they are interested in. It is important to give students a choice when creating books in the classroom. There was a video in her book about why it is important to have technology in the classroom. This video was interesting be cause it was from the students point of view. I would use this app in my classroom because it is another variety of giving a lesson. Students can read their section, highlight important details, find definitions, and can be quizzed on questions you pick. This app allows students to read what they want to read which is smart because text books can be boring. I like how the book also mentions a part of getting rid of text books to donate them to other countries. This tells students that community is important and allows them to be part of something. These are all things I would like to include in my classroom.